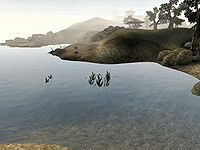 The largest of these plantations was the Dren Plantation, a large farm in the center of the region, north of Vivec. During the late third era, it was known for its connections with both House Hlaalu and the Camonna Tong. Esta página foi modificada pela última vez à(s) 00h45min de 2 de maio de 2015.